The D.C. incident has led to scrutiny of Nathan Phillips' service record after an organization representing him, the Lakota People's Law Project, described him as a Vietnam veteran in a news release and numerous media reports identified him as one afterward. WASHINGTON — Nathan Phillips, whose standoff with high-school students on the steps of the Lincoln Memorial last week captured viral attention online, has often discussed his military past. 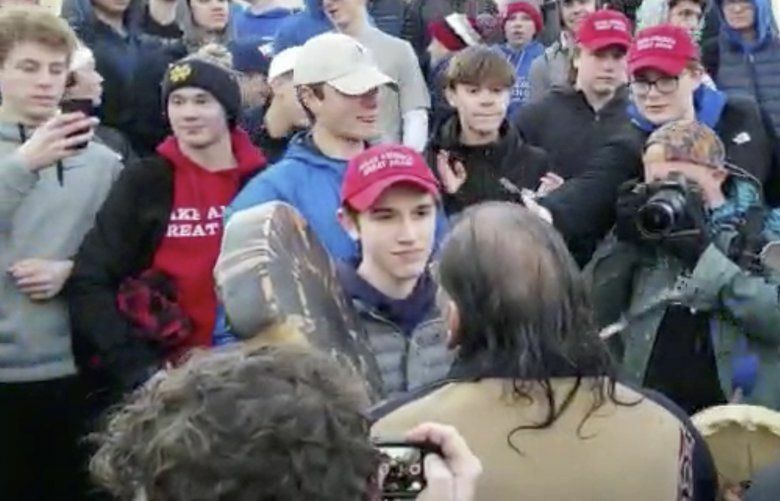 The sight of him surrounded by a group of teens wearing red baseball hats emblazoned with President Donald Trump’s “Make America Great Again” campaign slogan and the shifting narratives about the incident afterward have prompted political outcry from conservatives and liberals alike. The incident also has led to scrutiny of Phillips’ service record after an organization representing him, the Lakota People’s Law Project, described him as a Vietnam veteran in a news release and numerous media reports identified him as one afterward. Daniel Paul Nelson, a leader in the Lakota People’s Law Project, said in an interview that his group made the error and Phillips himself never told it that he served in Vietnam. The group, Nelson said, “trusted what we had seen” in previous stories about Phillips, some of which also referred to him erroneously as a Vietnam veteran. Phillips, who turns 64 next month, is not old enough to have deployed to Vietnam as a Marine infantryman, prompting accusations that he was lying about his service. The military will typically provide basic details about an individual’s military service within a day, but the situation with Phillips was complicated because he enlisted under another name associated with a family that raised him, Nelson said. He provided Phillips’ full Social Security number to The Washington Post with Phillips’ permission to help clear up the confusion. On Tuesday night, Donald Shipley, a Navy SEAL veteran who investigates military-service records, published a video in which he showed excerpts of Phillips’ service record. Shipley, who did not respond to an interview request Wednesday, noted that Phillips enlisted under another name and spent the majority of his time in the military as a refrigerator technician. He questioned how that squares with an April 2018 report by Vogue magazine in which Phillips is quoted saying that he was a “recon ranger,” a position that does not exist in the military. Nelson said that Phillips’ comments at Standing Rock were taken out of context, and that Phillips actually was referring to the work they were doing at the time on the reservation. In 2000, he told The Washington Post that he was a patriot who had served as “a Marine Corps infantryman” in the 1970s. He did not claim to have served in Vietnam and did not mention leaving the infantry after a few months to become a refrigerator technician. In 2015, he described himself in a video interview with MLive as “a Vietnam veteran times,” and stated that he served from 1972 to 1976. With all the scrutiny of Phillips’ military record, he has now been victimized twice, Nelson said.